I don’t know about you, but I’ve been obsessed with tater tots since grade school. I was usually a brown bag lunch kid, but on days when tater tots were on the menu I often made a trade. Over the past few years I had kind of forgotten about these little golden nuggets of potato goodness. Diets and healthy eating plans usually frown upon tater tots and taters in general. But then three restaurants reminded me of my love of these bite-sized spuds. That’s right, there are local three places where you can get tater tots with your meal and they are everything you remembered and then some. For a classic tater tot, head on over to Dew Drop Inn in Derby. These golden brown tater tots are a a little crisp on the outside and soft on the inside, and a little salty as they should be. A great compliment to any wing or burger order, Dew Drop’s tots come with a southwest dipping sauce that is a little tangy and compliments the tots. 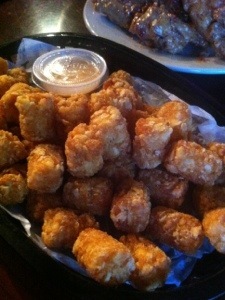 But beware, if you order tots at Dew Drop you’re going to get a full basket of tots, no skimping here! If you don’t want to attempt a full basket of tater tots you can get them as a side with any burger or sandwich (read more about how much I love Dew Drop here). For a traditional tater tot with a bit of a twist check out Plan B Burger Bar. Here you can get your tots plain, with cheese on them, or…as disco tots. Don’t know what disco tots are? Picture a serving of tots with melted cheese and gravy drizzled over the top. (Disco = gravy and cheese added, usually on fries at most CT diners). The tots in the center might get a little soggy from the gravy and cheese, but it’s the kind of soggy you want, it means the tots in the center are slathered in gravy and cheesey goodness. 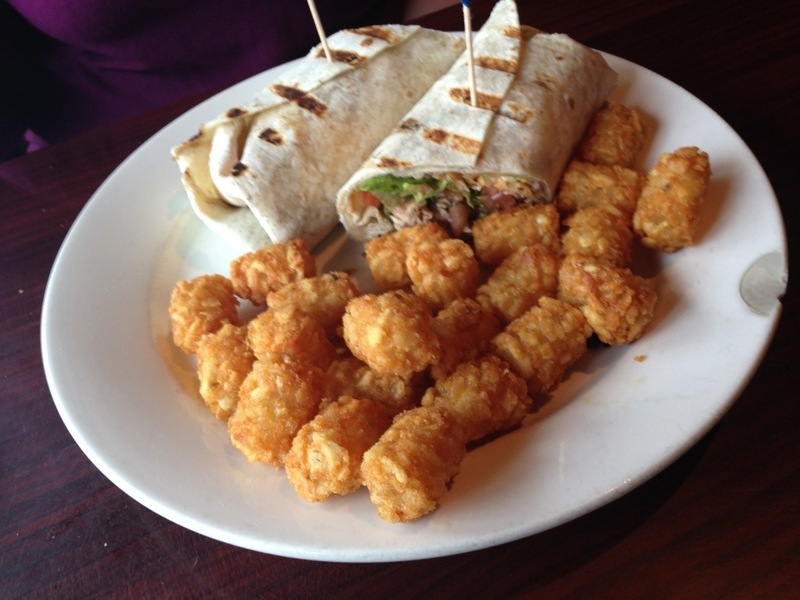 Plan B’s tots are a little salty, as French fries and tater tots should be. Your final option for local tots are the VERY unique Crab Tater Tots at Post 154 in Westport. The Crab Tater Tots at Post 154 are accompanied by a Tangy Lemon Verbata Ketchup. 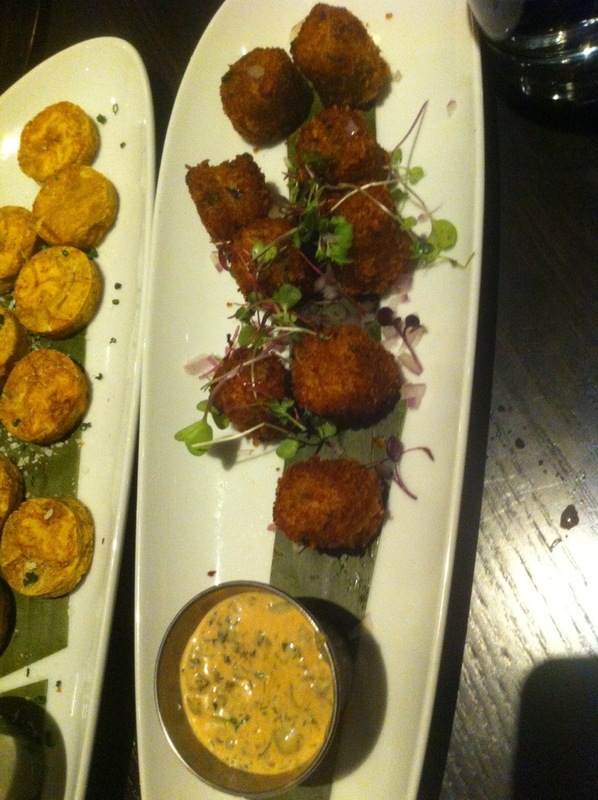 The outside of the crab tater tots are crisp as you’d expect in a tater tot, but not greasy. The inside has the consistency that is a little closer to mashed potatoes than the grated potatoes, however this tot is made of crab meat. The taste of crab is very light and the lemon verbata ketchup is a little tangy as promised by the menu description (read more about my wonderful dining experience at Post154 here). So whether you’re feeling nostalgic for a classic tater tot or want to try a more sophisticated version, this childhood favorite remains the perfect sidekick to your meal.